When we first walked in the Outdoor Retailer show we saw Allett. They make some of the world’s thinnest wallets and having been a fan of the butterfly wallet previously I was excited to see something new. Like the butterfly wallet vallett wallet is made nylon ripstop. They also have other versions of their slim wallet made from leather and leather with RFID blocking built-in. Allett makes both men’s and women’s versions of their wallets. For their original wallet size we found it can comfortably hold about 10 or 11 cards with some cash. Any more than that and you’re fighting to keep it closed or bursting the pockets just to keep your cards inside. With the women’s version you get four card pockets that can hold a lot more we found up to 20 was pretty good and didn’t feel like the seams were going to burst. If you’re like us you’re constantly adding and removing cards from your wallet. Whether it’s a Home Depot gift card your grandma gave you. Or an in store credit Walmart put on a card for you to use when you returned the old wallet you couldn’t stand anymore. We tried cramming as many cards as we could into the wallet and kept them in there for over a week or two. The wallet held up great I’m sure over time it would break in even more in the cards would feel comfortable. It’s worth noting on the new design of the Ellett wallet there is a grip on the inside of the pockets to keep the cards from sliding out. This was one of our biggest complaint about the butterfly wallet is the slick nylon ripstop would not hold the cards in place if the wallet was tipped upside down. Allett classic leather wallets put a nicer look on the ripstop nylon wallets. They’re made from a full grain leather and stamped with the logo. We love how leather wallets wear and stretch with cards as they’re added and removed from time to time. The only complaint about the leather wallet would be the thicker seem. It would be nice if the same could be reduced by either gluing or some other bonding other than stitching. 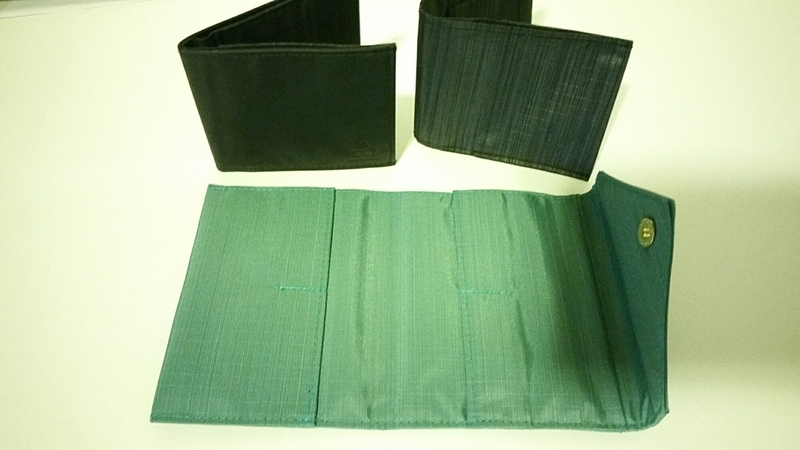 Allett has been making wallets in California since 1995. We have always been a fan of minimalist wallets and look forward to putting Allett wallets to the test over a long period of time. Based on what we’ve seen over the past few weeks they seem very durable lightweight and hold the cards very securely in place. We think the wallet could have been made a bit narrower to match the size of a USD bill. It would remove the unused space on the side of each card holder.